Elsewhere there were comfortable wins for Everton, Newcastle and Leicester. 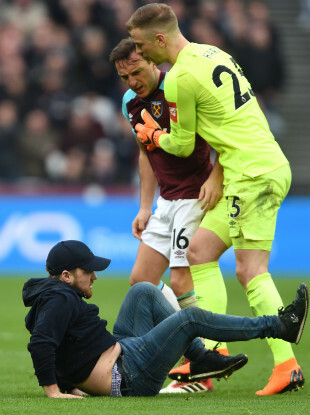 Mark Noble shouts at a West Ham fan after he invaded the pitch today. WEST HAM UNITED suffered a 3-0 defeat at the hands of Burnley in a game marred by crowd trouble at the London Stadium this afternoon. Substitute Chris Wood bagged a brace after Ashley Barnes’ 66th-minute opener as Sean Dyche’s visitors made it back-to-back Premier League wins to remain in seventh place. However, the game will be remembered for the actions of West Ham’s fans, with three separate pitch invasions forcing referee Lee Mason to hold up proceedings. Fellow strugglers Newcastle piled the pressure on Southampton manager Mauricio Pellegrino with a 3-0 win over Southampton. Kenedy (2) and Matt Ritchie were on the scoresheet for the home side and the win sees Newcastle move five points clear of the relegation zone while the Saints remain fourth from bottom, one point above the drop. The Premier League’s bottom side, West Brom, went down 4-1 at home to Leicester. Alan Pardew’s side had taken the lead through Salomon Rondon — marking his 100th top-flight appearance — but goals from Jamie Vardy, Riyad Mahrez, Kelechi Iheanacho and Vicente Iborra leaves them rooted to the foot of the table. Elsewhere, Everton secured a 2-0 win over Brighton courtesy of a Gaetan Bong own goal and Cenk Tosun. Indeed, the Toffees could even afford to see Wayne Rooney miss a penalty in a comfortable win. The other 3pm kick off saw Huddersfield and Swansea play out a scoreless draw. Email “Fans invade London Stadium pitch as Burnley hammer West Ham”. Feedback on “Fans invade London Stadium pitch as Burnley hammer West Ham”.